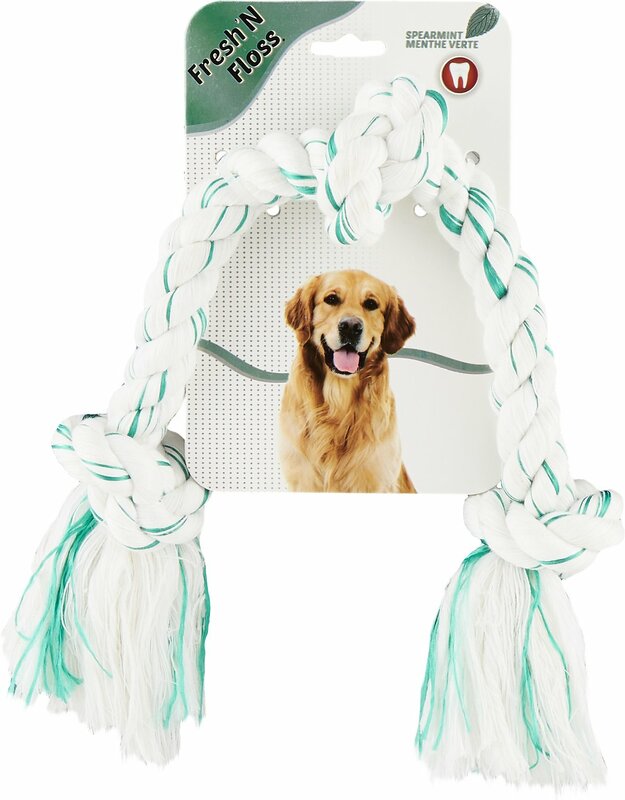 With Booda Fresh N' Floss, you can finally get your dog to floss on his own! This one-of-a-kind rope combines durable cotton with mint-scented floss for a unique twist on one of the most popular games between you and your dog. Features fresh-tasting baking soda and wax coated nylon strands to fight plaque and control tartar. Fresh N' Floss is non-invasive, non-irritating and sensitive to mouths and gums. My two 15 month old Samoyeds love these rope toys. They play tug of war, and chew (supervised) on them for long periods of time. These and the hard Nylabone ring are the only toys that have lasted. Our dog is a mixed breed, American Terrier and Boxer so at 80 lbs and a penchant for chewing I buy these 5 at a time so when one is shredded we can move on to the next. He goes through these relatively quickly and all while under our supervision. These are the only type of toys other than Nylabones we allow him all while under our supervision. This is just the type of dog he is and he loves to sling these around and work out the knots. Our lab pup loves tug - tires her out. I just wish I had gotten a larger one- my fingers have gotten in the way a few times. OUCH! A golden rope for my golden!!!! It really blesses my heart, as my golden is happily playing with this rope.. Hes like jumping and leaping for joy, and it’s good way for Iian to floss as well lol.. Loves playing with it, only thing is it’s kind of coming undone already, but she is a heavy chewer. Love the fact that it has teeth cleaning throughout it. So I’ll start by saying that this is a very good toy. My pitbull is very hard on toys most last about a few days to a week. My first one is on its way out so I decided to buy another one both were large. When the second one came it looked smaller than the old one. Opon further inspection they were the same length but different thicknessess which I thought was weird because I bought the same size both times. My boy has chewed through about 1/3 of the old rope so with this new one being thinner I’m worried it won’t last as long. Our young dog loves to chew both hard and soft toys, but anything with stuffing or squeakers makes a mess! This is a great chew toy as it does not shed as much as some and she is not chewing it to shreds very quickly. The large size is also fun for her to shake! I mostly got this because I liked the color. My dog hasn't quite gotten the hang of tug-of-war but he enjoys chewing on it. Because it's white I can definitely see it getting pretty dirty eventually. My cattle dogs love to tug on the rope. Then I put it up and give them other stuff to chew on. One dog will totally eat it, he loves it so much.